Thought to have been fashioned circa 1500, the Aztec statue of Xochipili, Prince of Flowers, was unearthed from the slopes of the volcanic mountain of Popocatapetl near Tlamanalco. The statue portrays the seated prince in regal attire, his features formed into an expression of ecstatic rapture. 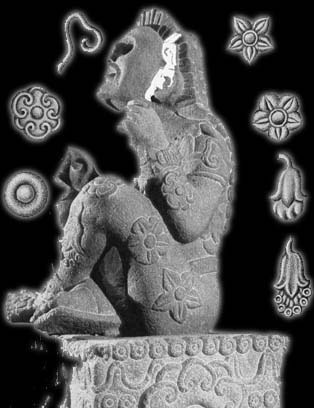 There is little doubt that he is undergoing some sort of psychedelic experience, for both he and the dais upon which he sits are decorated with motifs depicting the various sacred plants of the Aztecs; psilocybin mushroom cap, morning glory vine, flowers of tobacco, oliquiqui and sinucuiche. The ritual use of hallucinogenic plants was central to many of the religions of the various meso and south american cultures, from the pueblos to the Andes.